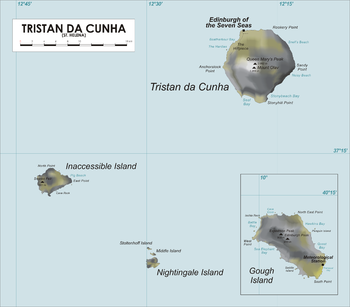 Tristan da Cunha is an archipelago of fairly small islands in the middle of the South Atlantic Ocean. It is a territory of the United Kingdom, officially administered by the government of St Helena, which lies thousands of miles to the north, but fully autonomous in practice. No visas are required, however visitors intending to stay ashore on Tristan da Cunha must receive permission from the Administrator/Island Council and have a landing stamp to that effect inserted in their passport. Write an email to The Admin Secretary [email protected] and specify when you plan to go, where you intend to stay and the purpose of your visit. Landing stamps may also be issued to passengers and crew of vessels not intending to go ashore, but who wish their travel document to be endorsed as a souvenir of the visit. There is no airstrip on Tristan da Cunha. Travelling to Tristan da Cunha requires careful planning. It takes five to six days to travel the 2810 kilometres from Cape Town. The South African polar research ship SA Agulhas and the fishing vessels Edinburgh and Baltic Trader do the voyage between Cape Town and Tristan da Cunha several times every year. A return ticket on Agulhas is about USD1300, a return ticket on one of the fishing vessels is USD800. Schedules and further information is available on the official Tristan da Cunha website. Several cruise ships visit between December and April. Due to rugged, steep terrain, going all the way around the island is difficult, but if just staying in the Settlement on Tristan, the flat, grassy ground is easy to manage. There is a paved road (the M1) from Edinburgh (aka The Settlement) to the Potato Patches, which are about 3 miles away. Local transport is available to the Potato Patches. This local transport could be an islander's car, tractor, and during the mornings a bus service also operates. Note that the bus is targeted at pensioners, who can ride on the bus for free. The charge is £5 return. Note that you cannot rent any vehicles on the island. The Island organises fishing excursions, walks, climbs and even golf for visitors. Take a trip to Inaccessible Island from the main Tristan Da Cunha Island. Despite the name, it is possible to visit the island. Only visitors escorted by guides from Tristan da Cunha are permitted to visit the island, and most visitors come as part of a cruise ship itinerary. Along with (relatively) nearby Gough Island, Inaccessible Island was made a World Heritage Site by UNESCO in 1995. Take a trip to Gough Island. Gough Island was first known as Diego Alvarez, but it was sighted again in 1721 by Captain Gough, from his ship the Richmond. This brought a new name - and a bit more attention - to the place. Although Gough Island is a UK territory, the only permanent settlement you will find there is South African. South Africa leases a portion of the island from the UK for use by SANAP as the only permanently manned South Atlantic Ocean meteorological station. The island is a UNESCO World Heritage Site. Gough Island has no sheltered harbour or anchorage. The only suitable landing place for boats is at Glen Anchorage in Quest Bay on the island's east coast. SA Agulhas, on a relief expedition, departs from Cape Town to Tristan da Cunha then onwards to Gough Island on an annual relief voyage. This ship carries cargo and passengers. There is presently no access for tourists and even crew members from passing yachts may not go ashore except in the case of an extreme emergency. Getting around comes with great difficulty - combination of excessively steep terrain and incredibly dense vegetation - and no paths to speak of. 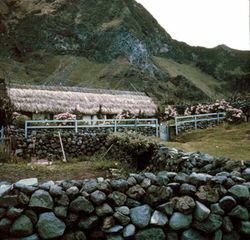 There are no public accommodations on Gough Island as well. Visit Cafe da Cunha for hot or cold drinks, sandwiches and hot meals,located in the Post Office and Tourism Centre. The Albatross Bar - the islands only pub is open in the evening Monday - Saturday and for a few hours on Sunday afternoon. A range of food and drink items are also available for purchase at the Island Store, which has sufficient stocks for all visitors. Prices from 1st September 2013 - existing bookings will be honoured at the previous rates: Full board accommodation is available in island homes at an inclusive rate of £50 per person per day including bed, three meals and laundry. Child under 12 years £25.00, under 2 years £5.00. Please note that 75% of the charge is paid to the island family and 25% to the Government. There is a range of government and private accommodation on Tristan. There are six guest houses available to rent on a catered or self-catered basis. Catered prices are in line with full board home stays, and self catered prices are £25 pppn plus utility charges. Child under 12yrs £12.50, under 2yrs £2.50. Please note that for privately owned guest house charges, 75% of the charge is paid to the island family and 25% to the Government. Booking information is available on the Island's official website. Relatively nearby to the south is Gough Island, another British dependency. You are able to call people around the world for the same rates you would in London UK. There is an internet cafe on the island. The internet speed for the computers at the cafe is a very slow 256kbps. It is unknown if there is any WiFi on the island. This page was last edited on 27 December 2018, at 11:17.